Normally I fight the urge to check my accounts mid-month because, I figure, I can only do myself harm with this information by trying to time the market. But checking in on our plan for financial independence seems like a pretty good reason to break the rule. And it looks like despite our mediocre efforts, we're slightly ahead of schedule. If you're interested in buying rental property and haven't yet read Brandon Turner's post from last week, definitely give it a read. Brandon gives some great approaches for finding a good deal in real estate, and the tips are helping us plan out how best to approach our rental home purchase. We're currently heavy in cash, as we are planning to purchase a rental home in the next twelve months, hopefully in cash. I can almost hear the hair being ripped from the scalps of personal finance gurus as they read that sentence. But we are comfortable with the opportunity costs, just as others are comfortable with risks inherent with investing while still in debt. Different strokes, you know? Although I agree that over most time periods, you are likely to come out ahead by leveraging a loan and investing the funds. We're just not comfortable proving that truth with our own money and needlessly taking on more debt. Plus, I like to think that being debt free allows us some freedoms & benefits that we wouldn't enjoy as easily if we had two mortgages and a bigger pile of investments. I'm already seeing how our debt free peace of mind is helping me perform better at work, to take calculated risks on my projects, and to be more confident in meetings with leadership. I'll never be able to quantify what (if any) additional compensation I might get from this, but my intuition is that a less-stressed, more confident worker will, in general, be better paid, all other things being equal. Additionally, my wife already has enough stress from getting her PhD; the last thing she needs is the stress associated with debt on top of that. Most importantly, we are happier being debt free. Peace of mind and happiness might not factor into financial analyses, but, at least for me, it's actually worth something: a lot more than relatively meager opportunity costs. I know that taking a different approach that involved multiple mortgages coupled with more investments would likely get us to our goal of financial independence even more quickly. We could change the blog name to "Done by Thirty-Eight". But our approach is a risk averse one, because we want to be sure we don't hit a bad market and then not get to our goal until forty-two. We're fine with a slightly slower & smoother ride, I suppose. I'll trade the chance to get there early for some assurance that we just get there on time. Thank you, sincerely, for reading and I hope you all have a great day. 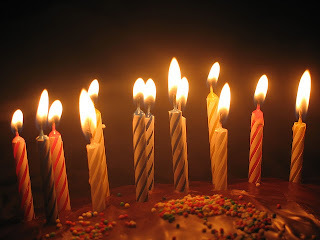 *Birthday cake photo is from Matt Comi at Flickr Creative Commons. Aw, thank you! Another Leo born in 1980. Rad! I'd love to chat about how to save more anytime...it's one of my favorite topics, even though there are some personal finance bloggers out there who put our spending & savings to shame. Happy Birthday - and whilst all the food sounds like a great present, I think beating your goals would be a pretty close second place on best gifts!! Congratulations, coming along swimingly! Thank you, Sarah. Yeah, you're right: hitting your goals is a nice gift, too! That's a heck of a progress report for 2013. Beating all your goals by August? Now just coast until 2014! Thanks Mrs. Pop! We actually didn't complete the calendar year goals by August, unfortunately. Since our blog is aiming for FI by the time I hit a certain age, our goals are all just measured on my birthdays. So while we're ahead, we're just not THAT far ahead. Who says too much beef is bad for you? This is the internet, I can take up any position and find "expert" articles to defend it. :) Happy birthday and congrats on the progress. So true! I know there are some paleo diet folks who firmly believe in a meat heavy diet. From the look of how healthy they all seem, they might be on to something. Happy birthday and congratulations on being ahead of your goals!! I'm inspired and may need to create a multi-year plan myself. And I LOVE how you celebrated the big 3-3!! Sounds like a great time! Thank you, Phoebe! It was a really good birthday...my wife knows what makes me happy. I'd love if you created a multi-year plan, if only so I could read it. It's kind of a fun exercise. Hi NetWorthWarrior. I'm glad to hear I'm not alone on this. And I really love when the comments section leads me to a new blog. Thanks for writing here, and I'm adding your blog to the reading list! I'm with you both on rather having a lower return than the risk (and the stress, which is more important to me) of being more leveraged. Happy Birthday! Seven years is going to fly by. It's awesome that you have your sights aimed in on something so big. Happy Happy Birthday!! That is so awesome that your wife threw you a fun surprise party, and it sounds like there was a lot of good eats involved!! Congrats, as well, for meeting your goals, and that's a great motivation to know that being debt free has also impacted other things in life, whether it be risks at work or in investing. It definitely makes a lot of sense! Thanks, Anna! We're gradually seeing more benefits of being debt free...I think they'll continue to show as we get more used to it. Happy Birthday! It looks like you had am amazing weekend: board games, vodka tonics, beef... that is a perfect combination! Also congrats on your progress! Things are looking really good and I am sure they will get even better in the next few years. We had a great weekend. And thank you for the encouragement! Happy Birthday! It sounds like you had a very good weekend! You're making brilliant progress on your goals - I love to see people beating their targets! I'm glad we're of the same mind on this front, and thank you very much for the well wishes. Happy birthday! We are also both 33 years old! Looks like you're doing great on your savings/investing goals! Great job! Woohoo! More 1980 folks. I never know what generation we fall into (like, the very last Xers, or the first Millenials, or what). Happy Be Lated DBF!!! And looks like all things are in order to get where you want to be which is DONE by 40! Are you buying properties local or out of your area? In in FL prices are a little steep. Thanks, Thomas! We are now leaning heavily towards buying locally, but will not be making a purchase or looking seriously until my wife gets back from her trip in February. I'll spend that time reading through the Bigger Pockets guidebook & forums, trying to learn what I can in the interim. True, that'd be great! It'd make for a less pleasing title, but that's okay. Thanks for the birthday wishes and kind words. Happy Belated Birthday! I was also born in 1980...a great year. Sounds like you guys had a great time on your birthday weekend. I don't normally like surprises but when my wife planned something similar with my friends, I did feel really special. You guys are doing well financially...keep it up! Thank you, Andrew! I also am not a huge fan of surprises but I think that just comes from anxiety of being the center of attention whilst being sung to. I think its cool that so many of the bloggers I like and follow were born in 1980. Sounds like you are doing really well! Happy Birthday! The 30's are awesome btw! Thank you, Tonya. So far, yeah, I'm really liking my 30's. They're like my 20's, without as many of the mistakes. You are doing really well. Keep at it. Rental properties can be a lot of work, but you are still young and have a lot of energy. Good luck finding the right property. That means a lot, Joe. I'm hoping to emulate a lot of what you've accomplished so your words mean a lot. Happy b-day, man! What board games did you play? Did you geek out or stick with party games? I don't know....as one of the former "finance guru" set, I would have a hard time telling you to take on debt when you want to be done in that short of a time frame. You'd have to find a way to cover the mortgage amount, and to do that you'd then have to invest the money in another, high interest vehicle....not exciting and maybe a little risky. One of my friends brought his daughter, and she wanted to play Life so we went with that. I hadn't thought about how the timeframe might affect the plan to utilize leverage. Keeping a 30 year mortgage around during FI might change how you approach that part of your life. I've got the podcast queued up. Stacking Benjamins, The Fantasy Football Guys, & Marketplace Money are my regular rotation these days. Thanks for putting the show out there. Happy Birthday! (August is the best month for birthdays, ours are only 2 days apart!) Congratulations on meeting your financial goals, that is an enormous accomplishment! I can't wait to see what's to come for you guys. Best wishes on another outstanding year. Thank you, Emily, for the birthday wishes, the really kind comment, and for the book! I'm excited to learn about lifestyle businesses: diversifying our income would be a fantastic change to our status quo. Happy birthday! I love reading your updates! Thank you, Keren! I'm happy you commented and have added SteppingItDown.com to my reader. Happy Birthday! I went to Red Lobster this weekend and had crab legs. So good. I have never had grass fed beef how was that? Congrats on your progress as well!! The grass fed beef was pretty darned good. I got a skirt steak and cooked it up in the cast iron. I don't know if our budget will allow us to get it all the time, but I'd like to maybe copy Evolving Personal Finances' approach and use extra grocery funds at the end of the month to buy some. Happy Birthday and best of luck finding a great rental property! Grass-fed beef, cheesecake, good drinks, and people who care about you...can't think of a better way to spend a birthday. Many happy returns to you! Thank you, Zoe! I couldn't have said it better. Wow, congratulations on your birthday and your wife is waaaaaaaaaaaaaay cool lady for the surprise. Rental house intrigue me greatly, so I look forward to reading about it in future posts! Yeah, I'm definitely a lucky guy. Thanks! We'll start looking for a rental property in August at the start of 2014, when my wife gets back. That'll at least give us some time to learn over at BiggerPockets. Happy Birthday! I'm celebrating my 35th next week, and it involves a trip to a Brazilian steakhouse (join their e-mail club and you get free dinner for your birthday!). I firmly believe that there is no such thing as too much red meat :) Congratulations on meeting your goals as well, and good luck finding a rental property! Thank you! I have never been to a Brazilian steakhouse but the idea of unlimited meat being carved right off the stake sounds pretty awesome. Thank you, sincerely for commenting, as well. I'm adding your blog to my reader and look forward to learning from you.